Hidalgo County Court-at-Law No. 1 Judge Rodolfo “Rudy” Gonzalez ruled in favor of Edinburg Consolidated Independent School District, finding it did not violate state law with regard to the $220 million bond election. Gonzalez denied a request for a temporary injunction against the district at around 4:30 p.m. Friday. The judge found no fault with the district’s distribution of information through brochures and presentations for the upcoming bond. He also found that “there was no evidence presented that any district employees were pressured, prompted or urged to either support or defeat the bond measure at such meetings,” according to the order. Attorneys and brothers, Javier and Jesse Villalobos represented Jane Cross and Jerry Rivera in the petition, alleging the district’s misuse of public funds and violation of ethics in disseminating information on Thursday afternoon against the district. Attorneys Kevin O’Hanlon and Juan “Sonny” Palacios defended the school district against the accusation. 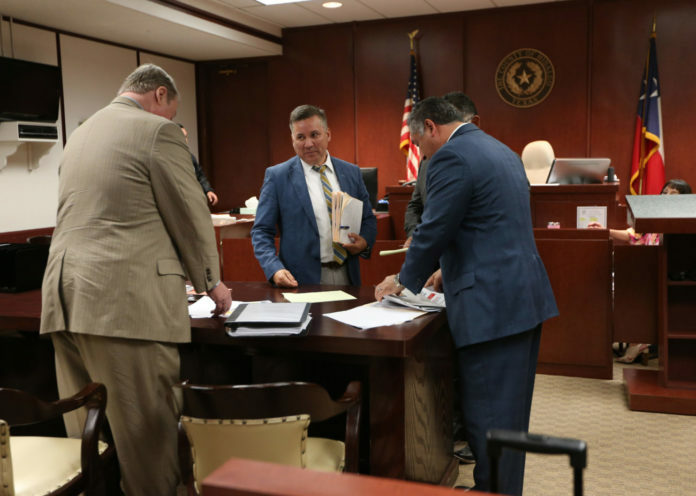 In addition, Gonzalez indicated that Edinburg schools Superintendent René Gutiérrez had the authority to hire Absolute Business Consulting Group to help disseminate factual information. The political consulting group is run by Karina Cardoza, and Mike Robledo is also affiliated. The contract cost the district $45,000, below the $50,000 threshold of signing it off without the school board’s approval, which became another source of contention for the Villalobos brothers. “We feel that we’ve always felt that we were doing the right thing because we had all our information vetted by our legal counsel before they were distributed,” Gutiérrez said. The district took the proper measures and will continue to do so, he said. “But ultimately it’s going to be up for the community to decide,” Gutiérrez said. The judge-approved proposed orders dismissed the petition made against Gutierrez and denied the temporary injunction. O’Hanlon and Palacios asked for the dismissal of the case as the district acted within its rights to disseminate information and hire the consulting group for public relations work. They went on to claim the Texas Ethics Commission ultimately has the authority to assert the claims made by the petitioners rather than the court. The brochures and presentations had factual information “and did not include content that constituted advocacy for either the approval or defeat of the bond measure,” as stated in their proposal. The Villalobos brothers asked the court to side with some of their original grievances while seemingly admitting to some of the defendant’s arguments, according to their proposed orders. The judge essentially denied their requests, deeming the brochures were merely informational and ruling that the consultants were bound by a contract that prohibited them from advocating for or against the bond. Villalobos also said he understood many teachers are in an “uncomfortable position” and wouldn’t be able to testify freely if they did have grievances. However Villalobos still advocates for a “fair election” and to serve his clients. The bond election will take place on May 4 with early voting beginning on April 22, continuing throughout that week.